"Kim Jong-un" in hancha (top) and Chosŏn'gŭl (bottom) scripts. کیم جونق اون (دوغوم: ۸ ژانویه ۱۹۸۴ یادا ۸ ژانویه ۱۹۸۴) شومالی کوره‌نین باشچی‌سی. ↑ "Rodman Gives Details on Trip to North Korea". The New York Times. 9 September 2013. Archived from the original on 10 September 2013. Retrieved 10 September 2013. ↑ We finally know the age of North Korean dictator Kim Jong Un. آرشیولنیب اصلی نۆسخه‌دن on 16 February 2017. یوْخلانیلیب20 May 2017. ↑ "The secret life of Kim Jong-un's aunt, who has lived in the U.S. since 1998". The Washington Post. 27 May 2016. Archived from the original on 29 May 2016. Retrieved 28 May 2016. 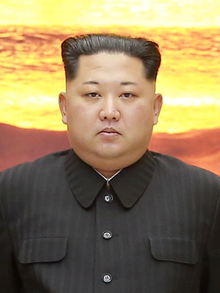 They can reveal, for example, that Kim Jong-un was born in 1984 – not 1982 or 1983, as has been widely believed. The reason they're certain? It was the same year that their first son was born. "He and my son were playmates from birth. I changed both of their diapers", Ko said with a laugh. ↑ Error on call to Şablon:cite web: Parameters url and title must be specified (ko). Naver (2 October 2010). یوْخلانیلیب2 December 2010. بۇ صفحه‌‌ سوْن دفعه ‏۱۴ نوْوامبر ۲۰۱۸، ‏۰۶:۰۵ تاریخینده دَییشدیریلمیشدیر.